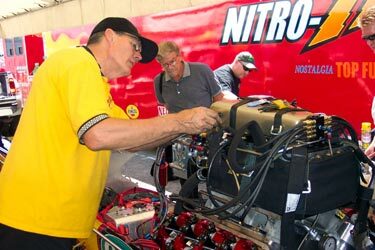 All things considered, Jim Murphy and the OSH-WW2 Racing team came out of the Goodguys 6th West Coast Hot Rod Happinin' in good shape. 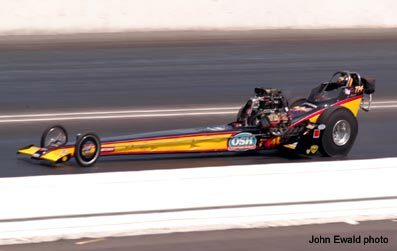 Battling hot and tricky track conditions all weekend, the guys left Pomona with a semi final finish and still holding on to the # 1 spot in the 2003 VRA Top Fuel Championship Points race. 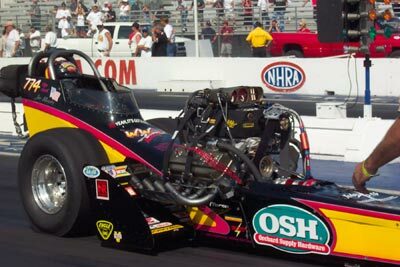 Even before the season started most everyone agreed that Murphy and Jack Harris would be the pace setters in Top Fuel. 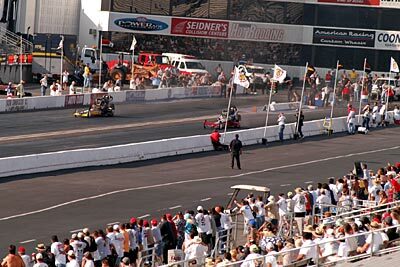 With only one VRA race left (Fuel & Gas Finals) the two are indeed on top of the heap and in a very close battle for the 2003 TF Championship. Murphy holds a slight lead (275 to 264) which means Bakersfield in November will be a nail biter for both. Who ever goes one round further than the other will be the Champ. 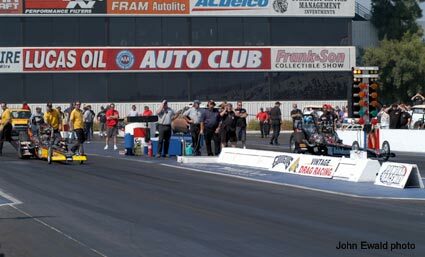 Although the teams set up on Thursday, for all intent and purpose the weekend started for the Top Fuel cars on Friday afternoon. 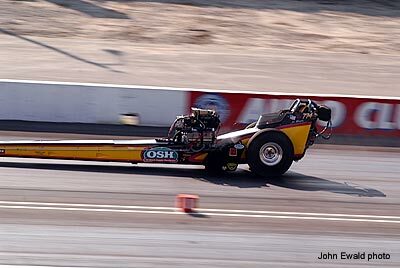 Due to the fact that these types of cars hadn't run at Pomona in two years meant their past data was near useless. And then there was the heat and extreme track temperatures to consider. 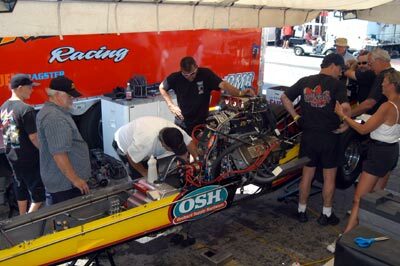 The first qualifying session was full of unknown factors. 4:30 PM - track temp 139 degrees. 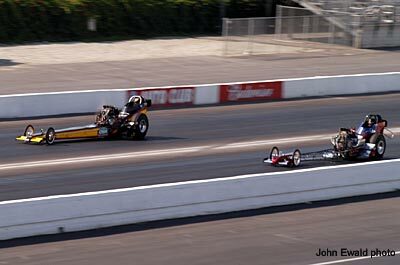 Both Jim Murphy and Lee Jennings Jr. had very good "base" tune ups and got down the hot track together. 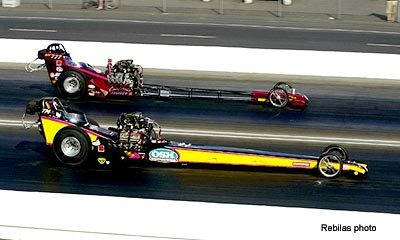 Murphy ran a conservative 6.23 @ 228 while Jennings carded a 6.24 @ 232. In this lights it was close. A nice side by side qualifying race. 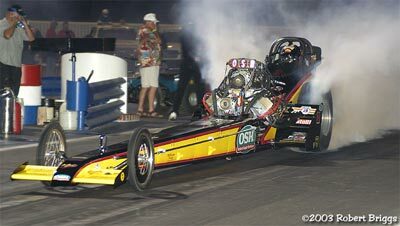 There's nothing like Top Fuel dragsters under the lights and this event featured two such qualifying sessions on Friday and Saturday night. 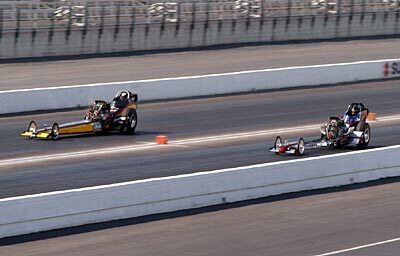 With cooler track temperatures and better air, the nitro cars should (at least in theory) run much better than they do during the day. The Friday night session proved to be an exception to that rule. 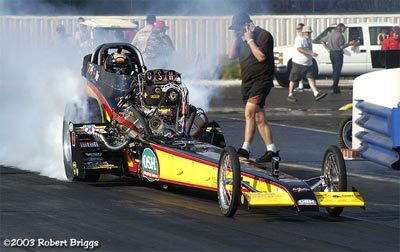 Only two cars improved over their earlier attempts and Jim Murphy wasn't one of them. 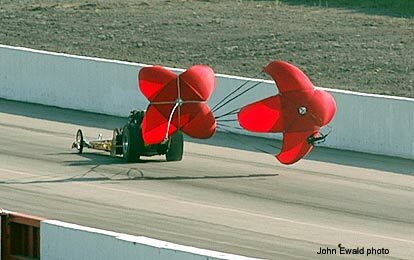 The OSH-WW2 Racing fueler was on a great pass (the data recorder had it in the 5.90s) when the car got loose at the 1000' mark and headed for the center line. Murphy reeled it in but not before barely hitting the timing lights. 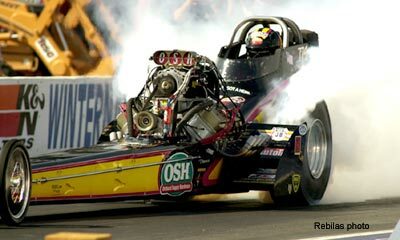 This resulted in a negated run and a dented front wing. 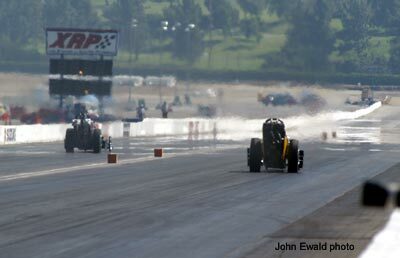 The third qualifying session went off late - 5:15 PM. This was a good thing in that the temperature had dropped to the high 80s and the track was ONLY 140 degrees (down from 145). This session paired up Murphy with Bob Muravez. 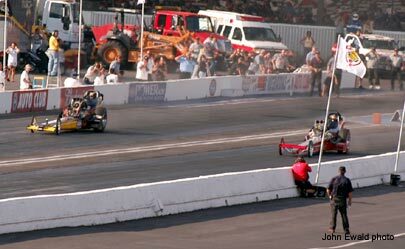 As seen from the grandstands, both cars left hard and it was a great drag race for 900' when Muravez shut it off. 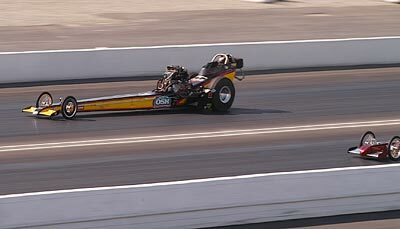 Murphy had no intentions of cutting his run short and went right down the middle of the hot track to record a nice 6.14 @ 235. 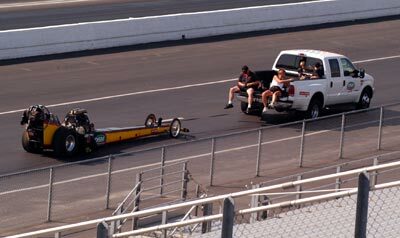 Towing back to the pits. 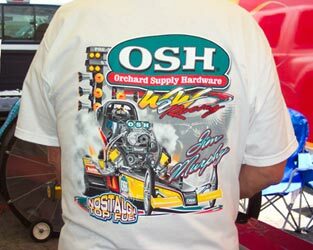 Speaking of towing back to the pits ... without a doubt the most popular promotion of the event was the give-away OSH (Orchard Supply Hardware) T-shirts that the WW2 crew threw out to the fans. To quote one lucky catcher, "This is the coolest thing I've ever got! For sure front line in my racing wardrobe!" And OSH thought the buckets were a big hit! 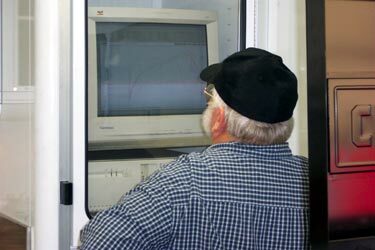 As always, Tim Beebe poured over the data collected on the previous run. 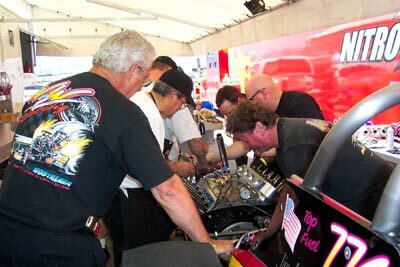 He figured going into the night session on Saturday the car would run in the fives with the cooler temps and better air. Session #4 - Saturday night. This is what the fans came to see and what a show they got. 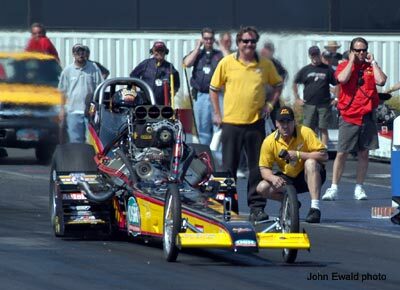 For the only time all weekend the #1 (Jim Murphy) and #2 (Jack Harris) VRA Top Fuel points leaders squared off. The masses expected a side by side 5 second race and nobody was disappointed. 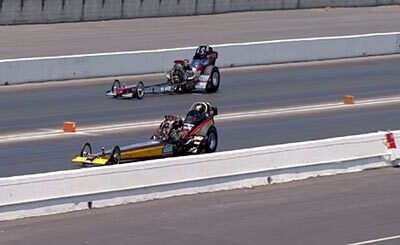 Murphy leaped up to the #2 qualifying spot with a stout 5.88 @ 225 with Harris trailing with a 5.92 but ran the backup for the speed record - 256.55. 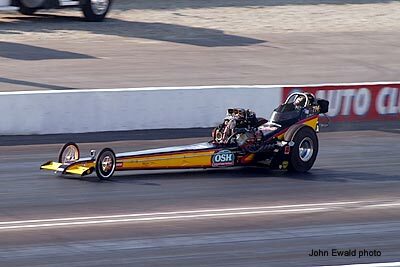 As a side note, this pass could well have been the quickest in history if not for a broken rocker arm at half track. 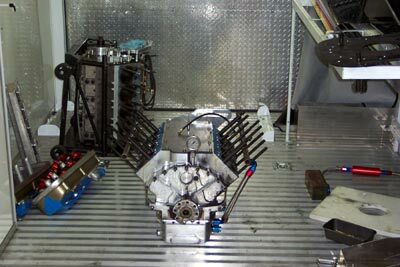 The data computer indicated that it should have been (had the engine stayed in tact) a mid to low 5.70 pass. 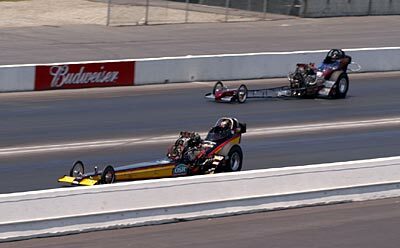 For you fans who are into numbers, check out the stats between the 5.80 run at Bakersfield in March against the numbers from this pass at Pomona. 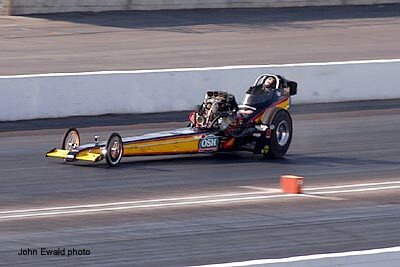 To quote Murphy, "As you can see the cylinder dropped and then a rocker broke at 4 seconds and the last half of the run was on 6 cylinders. One of these days we'll put it all together and be famous (LOL)." 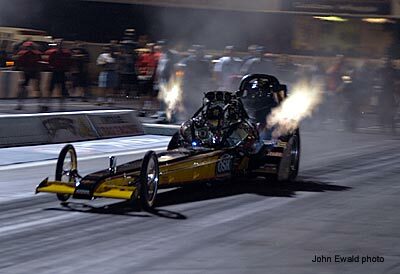 First round Sunday morning pitted Jim Murphy and Rick McGee. 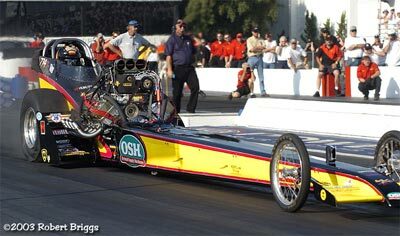 Had the Tedford & McGee car been healthy this could have been a great match up. 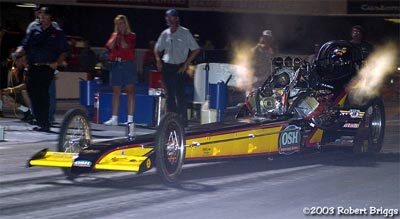 The cars left together but it was over early for McGee when he blew the tires off at the 200' mark. 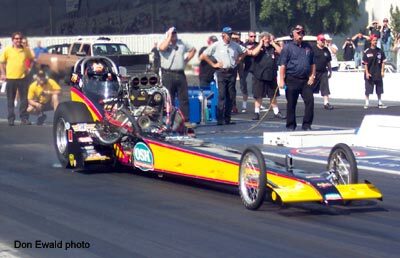 Murphy repeated his 5.88 (low ET in eliminations) qualifying time and run a ton faster at 241.15. 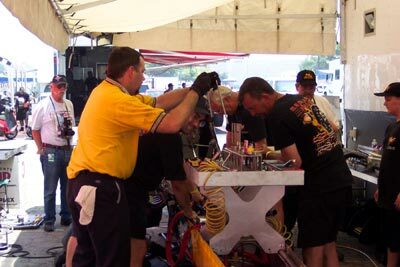 After their first round win over McGee, the crew busy swapping short blocks. With track temps once again rising into the 140 area, traction was becoming a rare commodity. In round two, Jim Murphy and Lee Jennings Sr. illustrated that in spades. 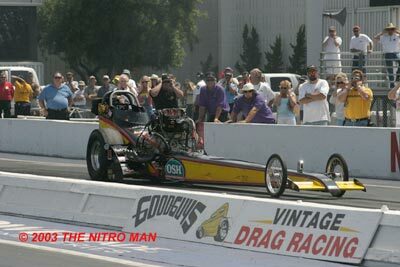 It was one ugly drag race with both cars leaving hard then going up in smoke before the 200' mark. 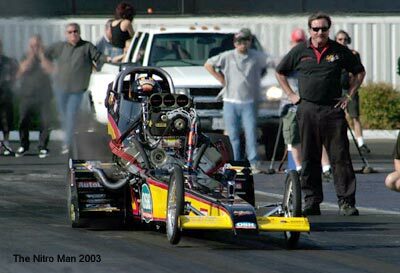 At this point both cars had blazed the tires, tried in vane to recover and shut off (note closed throttle blades on the injectors). Jennings had no way of knowing that the OSH-WW2 Racing entry had a broken throttle shaft and was literally dead in the water. Had he known, he may have given the gas one more whack but there's that big word "if". At any rate, both drivers peddled their hearts out and in spite of the broken throttle shaft, Murphy coasted through first. 8.64 to 8.91. 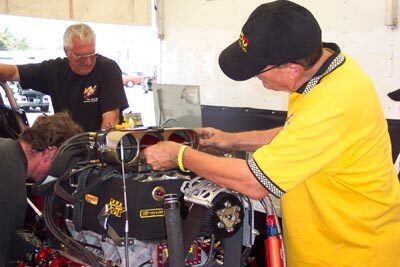 After dodging a bullet, Murphy replaced the broken throttle shaft in preparation of his semi final meeting with Jeff Diehl. 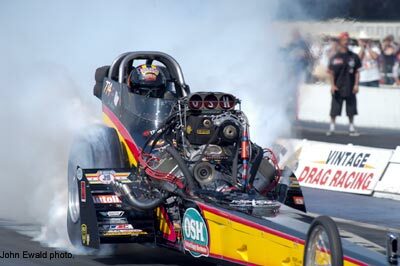 After all the second round antics, the Top Fuel semis were a crap shoot. After his coasting match with Jennings, Jim Murphy was paired with Jeff Diehl (who in a questionable call was back in on the break rule for Chuck Tanko). Murphy wanted this round badly - maybe too badly. Just off the line Murphy strikes the tires (see it starting in the shot below). 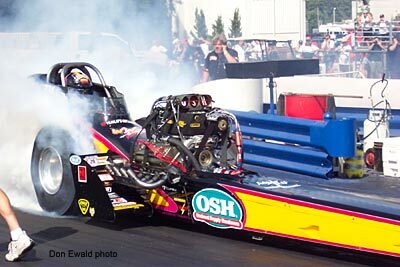 With Diehl streaking to a 6.09 @ 235 pass, all the throttle peddling and break pulling in the world wouldn't catch him. Making the most of his reinstatement, Jeff is going to the final. 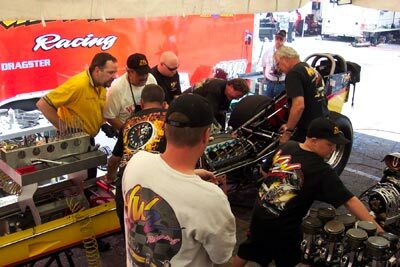 The weekend is over for the OSH-WW2 Racing team. Saturday afternoon saw a gathering of the Kings of Speed - the very exclusive "250 MPH Club". 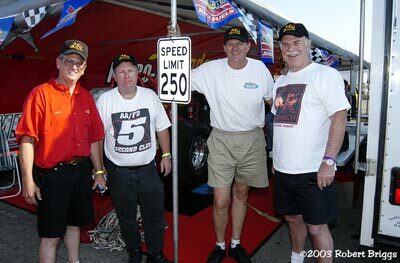 From left to right: Jack Harris, Howard Haight, Jim Murphy (who ran the first 250 ever) and Gerry Steiner. 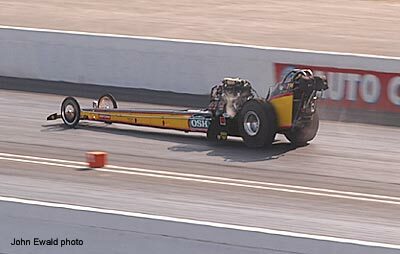 Sponsored by WDIFL.com, the club will follow a Bonneville format in that there are no set spots available. Since the 250 mark is the last frontier for the Nostalgia Top Fuel cars (and very hard to do), anyone who runs the speed will become a member.